Elizabeth Piantanida, MD (Colorado Springs) - Book Appointment Online! Skin MD Dermatology and Skin Enhancement Center is located near downtown Colorado Springs and services the entire Pikes Peak Region including Manitou Springs, Woodland Park, Pueblo, Monument and the Broadmoor Hotel areas of Colorado. We are a full service dermatology clinic and offer specialty skin examinations for the whole family and accept most insurance plans. 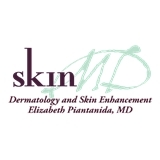 We are also a full skin laser center and medical spa founded and directed by Board Certified Dermatologist Dr. Elizabeth Piantanida, MD. We are proud to offer the latest technology in laser resurfacing, skin tightening, scar and blue light treatments. We expertly administer injectable treatments for cosmetics as well as injectable fillers. Our Medusa services include medical grade customized facials, microdermabrasion, dermaplaning and waxing services. I chose this office to have a mole removed for biopsy because they accepted my insurance and seemed very nice. I was not disappointed! The staff was very kind, the waiting room was SUPER cute and cozy, and the doctor herself was friendly and informative as well as comforting. I had a punch biopsy which was no fun, but I'm glad I had it here. 10/10 do recommend.